Quseir is situated on the mid southern coast, between Hurghada to the North and Marsa Alam in the South. It can be accesses easily by either of the two airports. Quseir, known in Ptolemaic times as the White Harbour, has a long history as one of the major ports of the Red Sea. From here, Queen Hatshepsut launched her expedition to the Land of Punt, as depicted in the reliefs in Deir el Bahari temple at Luxor. Legend has it that the expedition returned with 2 live panthers and 21 incense trees. The 16th century fortress of Sultan Selim, still standing in the centre of town, shows Quseir’s former strategic importance. Quseir was also a major point for pilgrims leaving for Mecca, as well as a significant trade route for spices from India to Britain. Today, Quseir is a quiet resort with turquoise blue waters, sandy beaches, a rocky shoreline and coral reefs. The coast is lined with mangrove swamps and unspoiled bays and coves. It is one of the most historical cities in the Red Sea. Quseir has its unique architectural style of stone houses and wooden windows overlooking the seaside promenade. People come here to relax and enjoy the peace and quiet of the small town and marvel at the beautiful fringing reefs that run the length of the coastline, whether by snorkelling or diving. The town’s narrow streets are lined with colourful bazaars which have a decidedly Bedouin accent. An ancient caravan trail, to Qift in the Nile Valley, leads from Quseir through the mountains, passing several Pharaonic and Roman sites. If history is not your thing, there are always the sandy beaches and the clear waters to explore and enjoy. Quseir is offering access to some of the south coast’s best dive sites. As well as offering excellent shore diving on little explored reefs; it is a popular port for live boards heading to the Red Sea’s most celebrated southern offshore sites. Windsurfing, kayaking and small catamaran sailing are also on offer to those wishing to try out other water-based sports. The coral reefs here are extremely diverse and provide excellent diving with a huge variety of dive sites from scattered pinnacles and out crops to pristine coral gardens and labyrinths of coral caverns and canyons just waiting to be explored. The sheer variety of coral growth astonishes with a full mixture of hard corals as well as the wonderful multi coloured soft corals. The marine life is just as impressive, with Napoleon Wrasse, lionfish, trumpet fish, moray eels, nudi-branch and goatfish inhabiting the reef areas while blue spotted rays, crocodile fish, cuttlefish and gobies are in the shallows. Out in the blue, Indian mackerel, tuna, jacks and snapper can be seen patrolling. And if you are really lucky you will get to see the elusive and shy Dugong or a friendly dolphin interactive encounter. Some of Quseir’s best dive sites include the beautiful drop off of El Qadim, the coral wall of Beit Goha and the networks of walls, caves, canyons and tunnels of El Kaf. However, diving parties here are small and restricted to a limited number of divers. This to help preserve the reefs. So, you will find your underwater experience to be tranquil and peaceful. The more isolated diving areas can by reached by jeep trips organised by local dive centres. Big Brother: This is a 400 m long island with lighthouse, about 65 km off the coast (wreck diving and wall diving). Little Brother: The smaller island which has a superb fan coral forest and plenty of caves, overhangs, black coral and a great deal of pelagic, including sharks, tuna, barracuda, turtles and reef fish. 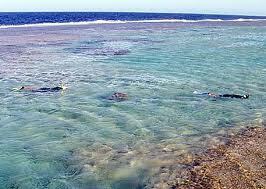 Erg el Asal: Big blocks of mountain coral surrounding a small flat topped reef can be circumnavigated in one dive. Clouds of goldfish engulf the reef and swimming through the sandy patches surrounding the reef white tip sharks may be found sleeping as well as turtles and barracudas. Sharm el Bahari: This dive site has a hard coral garden sloping gently to the deep. Large schools of unicorns, snappers, surgeons, fusiliers and barracudas. Sharm el Quibli: This site has a sloping reef covered in acroporas, fire coral and other hard corals. Lots of groupers. Marsa Wizri: The fringing houses large schools of yellow goatfish, unicorns, barracuda and other reef fish. Habili Sheikh Malek: This little reef formation creates a labyrinth of hard corals, fire and huge tables, where lots of fish often concentrate: Napoleon, barracudas and eagle ray. Ras Torombi: This site houses a great deal of fire coral, giant table coral heads scattered over a sandy bottom. Snappers, butterflies, rays and guitar sharks. Shoona: Dive site which houses schools of batfish, barracudas and goatfish, around the coral heads with glass fish which come out from the slope. The strict environmental regulations that were put in place to preserve the fragile coral reefs limit the water sports and activities to just a few areas along the coast that have access from the beach. Windsurfing, kayaking and sailing with small catamarans is however possible. Due to the ever-present winds, windsurfing is a beloved activity in this area of the coast. The Sultan Selim Fortress is located in the town centre of Quseir. It was built by the Ottoman Sultan Selim in the 16th century for protecting trade links with India. The fortress underwent many fortifications in later years even as it changed hands. In 1799 Napoleon’s troops occupied the fortress. The French fortified the fortress with cannons high up on the walls and also built a new viewing platform. After a few years the British took over the fortress from the French after a fierce battle. The British constructed a new gate to the fortress. The fortress retained its strategic importance up to the time when the Suez Canal was opened in 1869. Today the fortress houses the new Visitor Centre that displays the local history, culture and archaeology of the surrounding region. The historical settlement of Myos Hormos, located 8 km north of Quseir, was a major port during the Roman era and the main gateway to India and East Africa. The port’ history dates back to the 3rd century BCE. It was constructed during the Ptolemaic period. Roman storage jars or amphorae, pottery and other artefacts recovered from the site, point to a once thriving past. Historians reveal that during the time of Augustus, 120 ships set sail for India every year from the port carrying wine, glass, metal, textiles and pottery and brought back spices, silk, pearls, medicines and other goods. The foundations of ancient port structures are still visible and a number of traces of empty Roman storage jars can be seen. Pottery shards, which support the evidence of prosperous economic activity, are scattered all over the area. Wadi Hammamat (Valley of Baths), located halfway between Qena and Quseir, is known for the hundreds of hieroglyphic and hieratic rock inscriptions, which among others show rowing boats, hippos, gazelles and ancient goddesses, some of which are thought to date back to 4000 BCE. The wadi is also famous for an ancient road that runs through the valley. The road was the shortest route between the Red Sea and the Nile valley and was a widely used trade route in ancient times. Scores of ancient ruins line the route; remains of watchtowers, forts, wells and mines from various periods show much evidence of ancient quarrying and mining activity. Wadi Hammamat contains a variety of sandstone, greywacke and schist-type rocks. The colours of the rocks vary from a very dark basalt-like stone, through reds, pinks and greens. The here found Bekheny stone, is a beautiful green coloured stone that was considered sacred in ancient times. It was extensively quarried and used to make palettes, statues, sarcophagi, bowls and smaller shrines. At Bir Hammamat you find an ancient well and the remains of a Roman fort. The stone walls can still be seen, built to protect the well, 34 m deep, which had a winding staircase to the bottom. This is a great feat of Roman engineering and impresses on the visitor the vital importance of water in this arid landscape. A little way past Bir Hammamat to the northern side of the road, the road narrows into a rocky gorge between high, dark, jagged mountains towards Bir Umm Fawakir. This is where the concentration of a large number of rock inscriptions can be found. There is a small gafir’s hut opposite the inscriptions. Bir Umm Fawakir was an old gold mining settlement that dates back to the Byzantine period. A small community of Coptic Christians lived here and mined gold from the surrounding mountains. The extracted gold was washed and taken to the Nile Valley for refining. Ruins of the mines can still be seen. The largest mine goes straight into the mountains for a 100 m or so and is about 2 m high. Quseir is around 200 km from the most famous ancient capital of the ancient world – Thebes – or Luxor. So, if you visit Quseir you could easily plan a short trip to this ancient capital. Luxor has so many temples and historic monuments that it is virtually one enormous open air museum of Pharaonic Egypt. What about seeing the Valley of the Kings, Hatshepsut Temple, the Temple of Karnak or Luxor Temple! But it has a lot more to offer. Here you can engage with local Egyptian town life and its people. You can submerge into the souk looking for just that one present for home or drift down the Nile in a felucca enjoying the cool breeze of the late afternoon as the sun sets.